Dev Chatterjee reveals how ICICI CEO Chanda Kochhar and her husband Deepak Kochhar find themselves in a huge controversy. Residents of the tony CCI Chambers, opposite Cricket Club of India, in south Mumbai are in a state of disbelief. The Kochhars, one of their oldest and high-profile neighbours, are making headlines for all the wrong reasons. Chanda Kochhar, 56, managing director and chief executive officer, ICICI Bank, and her husband Deepak Kochhar, 60, find themselves in a huge controversy over the bank's loan to the Videocon group. 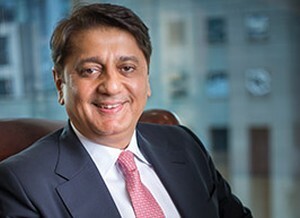 Deepak is facing a Central Bureau of Investigation preliminary enquiry for Videocon group Chairman Venugopal Dhoot's alleged investment of Rs 640 million into a company owned by him, just a few months before ICICI Bank disbursed a Rs 32 billion loan to the group in 2012. "We are all surprised. This was not expected. Let us hope that they come out of it without any further problem," said a neighbour. Deepak, son of a military officer, is well known in the corporate circles of Mumbai. Despite owning several expensive properties across Mumbai, the Kochhars prefer to live in their south Mumbai apartment. Deepak, old-timers say, has always been ambitious. After graduating from Mumbai University, he joined the Jamnalal Bajaj Institute Of Management Studies to get a master's degree in finance. There Deepak met Chanda Advani (now Chanda Kochhar), who was from Jaipur. While Chanda decided to get into a stable salaried job at the erstwhile ICICI in 1984, Deepak decided to work for himself. To sharpen skills, Deepak attended an advanced management programme from the Harvard Business School. But luck was not on his side. Court filings show that a winding up petition was filed in 2002-2003 against Credential Finance, the company set up by Deepak with his brother Rajiv Kochhar, due to liquidity problems. The Bombay high court appointed an official liquidator. Since the advances were not recovered, these loans were written off and claimed as deduction from the tax department. "Government-owned institutions like Sicom lost money in the gamble. These institutions wrote off all their loans," said a former Sicom manager. The shareholders of the finance company also lost money as Credential Finance was struck off stock exchange registers in the early 2000s. Rajiv, a co-promoter of the failed Credential Finance and son-in-law of Maharashtra's then chief secretary Sharad Upasani, parted ways with his brother to set the Avista Advisory group in Singapore, with offices in India. The CBI is currently investigating whether Rajiv's company helped ICICI Bank's clients in restructuring their foreign loans. On Thursday, April 6, the CBI stopped Rajiv at Mumbai airport when he was about to leave for Singapore. He was questioned for 8 to 10 hours at the agency's Mumbai office (for three days, till Saturday) on his business dealings with ICICI Bank. Rajiv has denied any dealings with the bank. While Deepak's businesses floundered, Chanda's career boomed. Within two decades, the Kochhars were among Mumbai's affluent families. Chanda was being featured prominently by all the pink papers. She was often listed among India's most powerful women and was awarded the Padma Bhushan in 2011. Their family's status can be gauged by a look at the star-studded guest list at the wedding of their daughter Arti in December 2014. Guests included politicians P Chidambaram, Uddhav and Rashmi Thackeray, and businessmen Gautam Adani, Mukesh Ambani, Dilip Shanghvi, Sunil Mittal, Rahul Bajaj, Kumar Mangalam Birla, Dr Swati and Ajay Piramal and Deepak Parekh. Amitabh Bachchan, the brand ambassador of ICICI Bank, and Shah Rukh Khan also joined in. Union Ministers Arun Jaitley, Piyush Goyal and Nitin Gadkari were also part of the event. In 2008, Deepak set up NuPower Renewables in equal partnership with Dhoot. Dhoot exited his investments of Rs 0.25 million within days and his stake was taken over by an aide, Mahesh Chandra Punglia. In 2010, Supreme Energy, one of the Videocon group companies, gave a loan of Rs 640 million to NuPower, so that the latter could expand its solar energy business. In April 2013, Pinnacle Trust, owned by Deepak, purchased Supreme Energy along with its liability of Rs 640 million (optionally convertible debentures). The investment by the Videocon group was made just before ICICI Bank disbursed a Rs 32 billion loan to the consumer durables company, thus raising the question of conflict of interest by a shareholder, Arvind Gupta, who wrote to the prime minister's office in 2016, seeking investigations. A preliminary enquiry by the CBI was filed in February 2018 while the income-tax department sought all documents from NuPower. Sources in the ICICI Bank said the loan was not new and it was disbursed after Videocon's loan was consolidated as part of a wider 20 bank consortium. "Videocon promoters always paid off loans and are not defaulters. We received our money till December 2017," an ICICI Bank official said. Another investment under CBI investigation is the infusion of Rs 3.25 billion by a Mauritius-based company -- DH Renewables. Statistics submitted with the ministry of corporate affairs shows NuPower lost substantial money and was able to operate only 180 Mw of power, compared with the target of 700 Mw. On March 28, the ICICI Bank board issued a statement to defend Chanda Kochar. The controversy also saw ICICI Bank losing substantial market value. Dhoot says he exited NuPower within days, as he got busy with the launch of the group's telecom services and oil and gas business. "We lost the telecom business due to a Supreme Court judgment in 2012 and soon after oil prices fell. We have never defaulted to any bank loans and we don't want any bank to take any hair-cut. In fact, we paid all our dues to ICICI Bank till December 2017," said Dhoot. According to a source, NuPower will return the Rs 640 million back to Videocon group by 2021 along with interest. Deepak said his wife was not aware of his dealings with Dhoot and was informed only after Dhoot exited. <p'Where is the conflict of interest? ICICI Bank will have relationship with all top corporates in India. If I can't touch any corporate who deals with ICICI, is it fair to me? Can I function like this? I am an Bajaj MBA and a Harvard alumnus. I am an educated professional. Should I sit at home just because my wife is CEO of ICICI Bank?' he told the India Today television channel on Friday, April 7.